This Sunday we are heading to our beach house, which, if I may add, is only an hour away. Perfect, when you’re traveling with loud and impatient boys (that also includes my husband). Este domingo estamos saliendo para la casa de la playa, que, les cuento, queda sólo a una hora de distancia. Perfecto, cuando estás viajando con chicos ruidosos e impacientes (lo que incluye a mi marido). The simple combination of cold weather and the sound of the ocean is so inviting I wish I could stay there forever. La combinación del clima frío y el sonido del mar es tan atrapante que podría quedarme allí por siempre. I couldn't be happier about leaving the big city and all its worries behind, even if it’s only for 24 hours. Estoy tan feliz de dejar la gran ciudad y sus problemas detrás, aunque solo sea por 24 horas. I’ll tell you how it went on Monday! Les cuento cómo me fue el lunes! ¡Les deseo a todos un domingo maravilloso! :))) have a good weekend!! love your blog! follow each other?? This is sounds lovely dear, have a great weekend. Love this photo, so inspiring. The cheery umbrella against the desolated background is such a muse! Hello, Ines (beautiful name!). Hope your had a wonderful weekend at the beach, I can't wait to hear about it! Thanks for stopping by my blog! Have a lovely weekend! I recently stumbled across your blog and I LOVE it! I love the layout to the content and everything in between! Your blog is simply the epitome of perfection! I am your newest, most avid follower, I look forward to reading your future posts. I would love it if you could perhaps follow me back too? Oh wow, the southern end of the world...Please take us there!!!! That amazing photo and your description makes us want to leave the Northen end of the world ASAP! Thx for giving our blog some warming love! So happy to see you at our place. 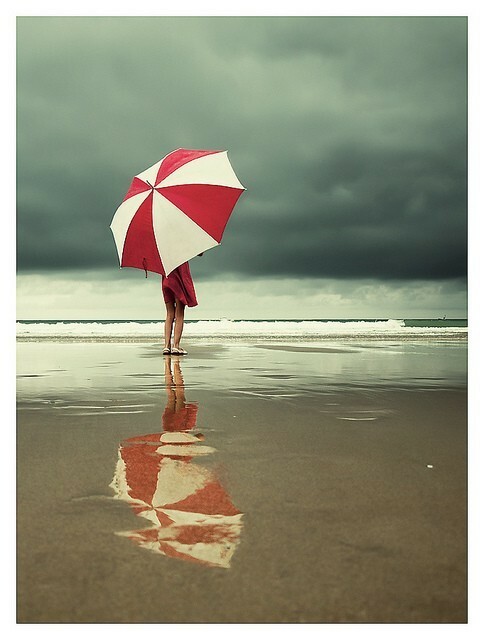 love love the umbrella picture! Hope the weekened was amazing. I love beach houses and the amazing calmness they give. Have a great start to the week, sweetie. Very inspiring post Ines. I totally love it!!! Hi Inès, you're very strong by giving me this great inspiring wish to be in autumn near the sea... i'd love to see pics from your holidays home! !